Don't you feel less stressed already? dead lime. dead line. toe MAY toe. ta MAH toe. it's all the same right? do you need a dt coke? Ha ha. Oh Brodi you always make me smile. I am sorry that you are stressed! I am sure it will be great. Hang in there. Some blond chick told me recently that "the only way out is through." Boy, she was wise. If it makes you feel any better, I have a self-imposed deadline coming up next week. Yeah, I didn't think it would. Good luck anyway! GO YOU!!! You can make it through this!!! sounds like you need a visit from the diet coke fairy again. Let me know if I can help with anything. You will make it! I believe in you! Your the BEST! Jenni and Aubrey- Thanks for the vote of confidence! Mundie Moms- I know! 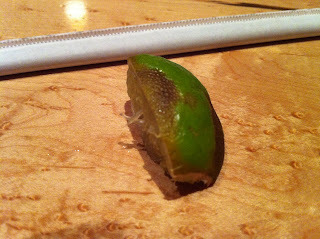 And what are the chances someone would actually be talking about a dead lime? Jenn- In the words of Douglas Adams, I love deadlines. I like the whooshing sound they make as they fly by. Oh wow, you really made me laugh a lot! I'm so sorry you are feeling so stress... but don't worry, I'm sure you are going to make it in time! i'm cheering from you already! Hugs and when you feel stress think of your fans, we all love you!